Anti-tuberculosis play at Lyric Theatre, 901 E. Broad Street, Richmond, Va.
French bacteriologists Albert Calmette (1863–1933) and Camille Guérin (1872–1961) finalized the Bacille Calmette-Guérin (BCG) vaccine for tuberculosis in 1921. The vaccine remains the only tuberculosis vaccine in use today. While not perfect, it is one of the most widely used vaccines and reaches more than 80 percent of all children in countries where the disease is common. 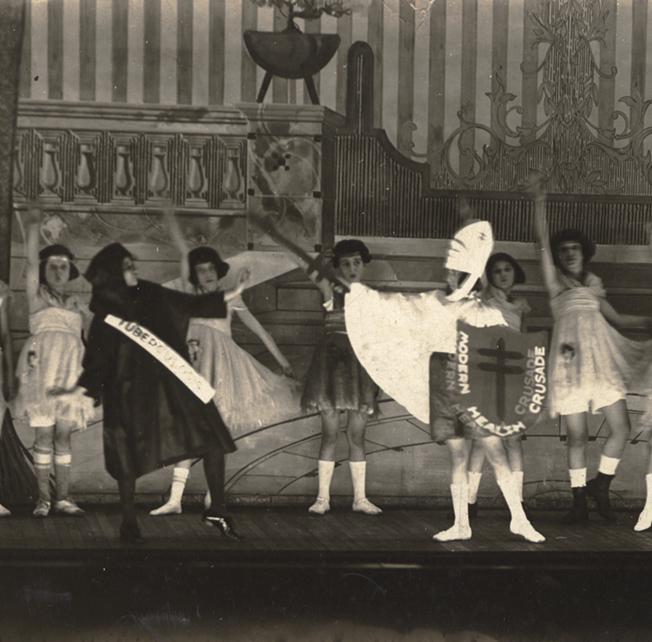 The BCG vaccine was a major weapon in public health efforts to fight tuberculosis—an ongoing battle dramatized by Richmond children in this 1921 play. In this panoramic photograph, a "Modern Health Crusader" brandishes a sword shaped like the double-barred cross that was the emblem of the crusade. The crusader carries a "Modern Health Crusader" shield and fights "Tuberculosis" who is dressed all in black. The Modern Health Crusaders campaign was devised by Charles De Forest of the National Tuberculosis Association. This Work has been digitized in a public-private partnership. As part of this partnership, the partners have agreed to limit commercial uses of this digital representation of the Work by third parties. You can, without permission, copy, modify, distribute, display, or perform the Item, for non-commercial uses. For any other permissible uses, please review the terms and conditions of the organization that has made the Item available. Cook, Huestis P. (photographer), “Anti-tuberculosis play at Lyric Theatre, 901 E. Broad Street, Richmond, Va.
,” Social Welfare History Image Portal, accessed April 26, 2019, https://images.socialwelfare.library.vcu.edu/items/show/311. Log In | Proudly powered by Omeka.